This works better as an important history lesson than it does as a dramatic movie. It’s better written than it is edited, more authentically staged than it is emotionally engaging. It feels slow, stretched out, very talky. It might have been equally effective as a reading on National Public Radio. And, while we develop great respect for Dr. Martin Luther King’s ability as a preacher of great power and vision, we never really understand his charisma as a great leader; he’s a man of strong words, he never exudes a strong sense of presence. And yet, this is part of history that must be known, if only to recognize all that King accomplished – and all that is still left to be done. David Oyelowo plays King as a man who’s mesmerizing when he’s behind a microphone, humble and very human, determined and often discouraged when he’s not. Oyelowo’s performance is better than the overall film which focuses on one issue – the right of Black people to vote – and one three-month period of time in 1965 when Dr. King led a campaign of civil disobedience to encourage President Lyndon B. Johnson (Tom Wilkinson) to speed up the passage of the Voting Rights Act to make that possible. While Blacks are portrayed sympathetically, Whites are shown mostly as vicious, close-minded, angry bigots. LBJ is the exception and Wilkinson plays him as a complex and committed man struggling to juggle all the burdens he carries, a man more like King than either would admit. But much of the film feels like a miscellaneous collection of moments and marches, with an extensive number of close-ups of Dr. King half hidden in shadows. Over those moments, director Ava DuVernay gives us history lessons, using the march from Selma to Montgomery to provide an overview of the Black experience on the way to equality. This movie explains, clearly, what was happening and why and how and why it all changed. We understand it; but we never really feel it. 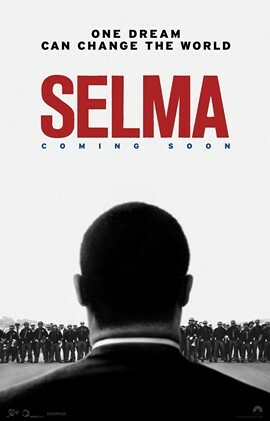 Think of “Selma” as “still life with violence.” This is a good movie, but it’s not a defining one. Martin Luther King deserves better.